As I’m sitting here enjoying a Duke of Hazzard marathon on CMT, I was reminded of column I wrote back when I was the Sports Editor for the University of North Alabama’s school paper, the Flor-Ala. I decided to dig up my copy of the column, you can see the original here, so it could forever logged in The Life of JWo archives. Unfortunately I don’t know the exact date the column appeared, but below is the column as it appeared back in 1995-1996. After 22 years of long, hard looking, I have found the perfect place to live when I graduate. I’m moving to Hazzard County, the home of the Duke clan. As odd as it may seem, Hazzard County ranks as one of the best places in the world to live. I have been watching the reruns of The Dukes of Hazzard, which comes on daily a 3 and 6 p.m. on TNN, and have noticed that Hazzard County really is a great place to spend the rest of my life. I don’t understand why there hasn’t been a great exodus to Hazzard County with the four obvious reasons that I have seen. First there is the weather, then the cuisine, the social life and the miscellaneous. No one really knows where Hazzard County is, but it has the best climate in the world. Think about it. It never rains in Hazzard County. As an extra added bonus, it never seems to get cold either. You never see any one person, be it Bo and Luke, Daisy, Uncle Jesse, Roscoe P. Coletrain, Boss Hogg or Cooter, drive with their windows (or tops) up. The cuisine in Hazzard County should be world-renowned. Every time Boss Hogg or Lulu sit down to eat, they have a seven course dinner that usually consists of some type of potatoes and a huge chunk of meat. That has to be some GOOD fried chicken. Taking a look at the social life in Hazzard County requires only three words: the Boar’s Nest. If you want to wet you whistle with a brew, the Boar’s Nest is the place for you. If you want to listen to some music and shoot some pool with a bunch of rowdy pals, then head to The Boar’s Nest. Every now and then you will be able to catch some band playing at the “Nest” when they get caught in one of Roscoe’s speed traps. The best thing about the Boar’s Nest is the bar room brawls, which seem to take place when someone gets a little to frisky with Daisy. Under the miscellaneous category I have placed several things. Number one: Despite all of the dirt roads, you don’t ever have to wash your car. Number two: You never have to wash your clothes. 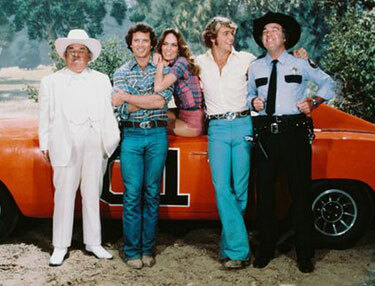 Bo always wears that yellow shirt; Luke has his denim shirt; Jess has his overall, tan shirt, and red thermal underwear; Boss Hogg has his white suits, while Roscoe has his police uniforms. Number three: No matter how bad you wreck your car, from jumping trains or hitting fences, Cooter’s one-hour repair service is guaranteed. I used to think Gilligan’s Island was the best place to live, but there are always monsoons, there’s no meat to eat, and you have to live in a grass hut. Since my secret of Hazzard County is out, I can only hope it doesn’t get too crowded before I get there. Regardless, I have sent my down payment in and will be there before you know it. Everyone is welcome to come and visit. We’ll go to the Boar’s Nest and party down with the “Boys” when you get there. Gallery | This entry was posted in Daily Life and tagged daily life, humor, postaweek2012, television. Bookmark the permalink. This is more like it. No more tears. But I think you underemphasized the main reason any college-age man would want to move to Hazzard County – Daisy Duke. Good stuff! Though I could still make a good argument for Gilligan’s Island.